The city of Kharkov, the Soviet Union’s third largest city, was the site of three heated battles during WWII. The city in southern Russia was initially captured by attacking German forces in 1941. In 1942 it was the object of a failed Soviet offensive, and then it changed hands twice in 1943 before being finally regained by the Red Army in August. In the course of these battles, 70% of the city was destroyed. 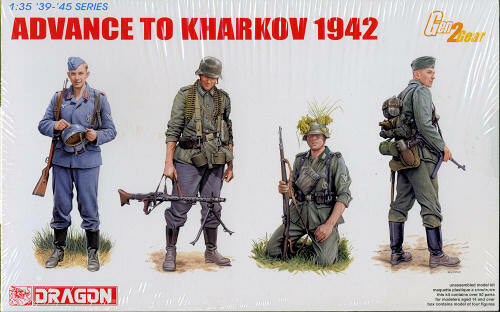 Dragon has released a new set of 1/35 scale figures that relate to the so-called Second Battle of Kharkov in May 1942. The Soviets launched an offensive against the German 6th Army to recapture Kharkov, but German forces successfully countered it and cut off Soviet troops with a bold pincer movement. More than 200,000 Soviet troops were killed or captured in the “Barvenkovo mousetrap” near Kharkov, amounting to a huge debacle for the Red Army. Dragon’s new box of figures represents four German soldiers during this decisive battle of 1942. It shows soldiers preparing to move forward to join the battle in the vicinity of Kharkov, and they wear typical uniform and paraphernalia relating to this period of 1942. Three of the figures wear standard Wehrmacht uniforms, while the fourth member of the party belongs to a Luftwaffe ground unit. They carry a variety of weapons, including a gunner with an MG34. Around his neck is slung a pair of drum magazines for his weapon. Indeed, all their weapons and personal equipment are produced to Gen2 standard. While the figures are linked directly to the Kharkov fighting, they still remain versatile enough to be used in a multitude of other settings as well. Thus, these finely posed figures are readymade for a creative German vignette.